Ottawa’s own Karen Sparks kicked off five days of international show jumping competition at the CSI3* Ottawa International Horse Show with a win in Wednesday’s CSI3* Welcome Speed, presented by Deloitte, at Wesley Clover Parks in Ottawa, ON. 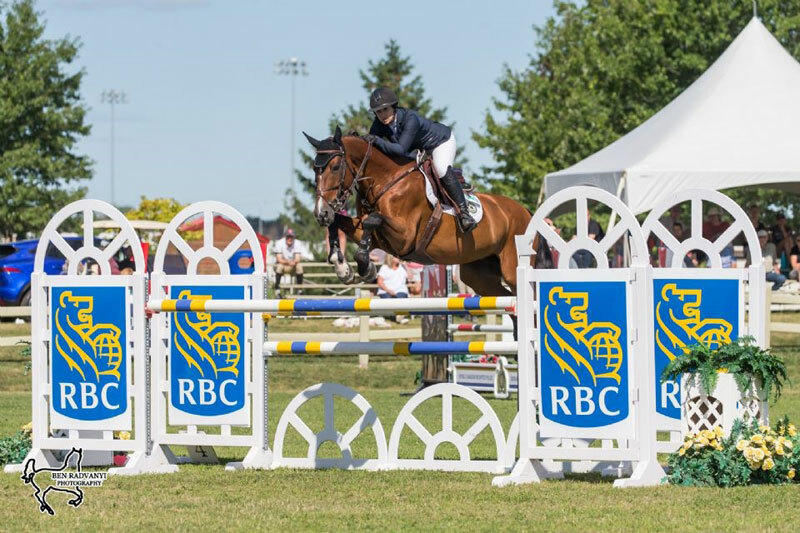 Following the success of last week’s national competition, the CSI3* Ottawa International Horse Show running through July 22 has attracted equestrian athletes from around the world including Canada, Ireland, New Zealand, and the United States. The winner of the first competition sanctioned by the International Equestrian Federation (FEI) didn’t have far to travel, however; Sparks is not only a local resident and competitor, she is also the Executive Director of Wesley Clover Parks. “I can’t think of a better place to win!” said Sparks, 37. “Our vision is coming to fruition with this show, and to win in front of my kids and my friends; it couldn’t be any better. Only two clear rounds were posted over the track set by Ireland’s Alan Wade, who will also be handling course design duties at the upcoming 2018 FEI World Equestrian Games in Tryon, NC. Sparks set the time to beat at 77.76 seconds riding Teddy du Bosquetiau, a 15-year-old bay Belgian Sport Horse gelding owned by Brookstreet Stables. The only other clear round came from Kelly Soleau-Millar, 34, of the United States, who trains with Sparks at Millar Brooke Farm in Perth, ON. Riding Cacharel, an 11-year-old grey Dutch Warmblood mare owned by Donna Vanderwoude-Dyment and Bridge Brook Arms, Soleau-Millar stopped the clock in 78.97 seconds to finish runner-up. Two other competitors also jumped clear but were caught by the clock, each incurring one time fault for exceeding the 79-second time allowed. 2016 Rio Olympic team silver medalist Lucy Davis of the United States was quicker to place third riding Caracho 14 while Nicole Walker of Aurora, ON, took fourth aboard Excellent B. New Zealand Olympian Kirk Webby had the fastest time of the day, 70.02 seconds, but a rail down for four faults left him in fifth place with Brando du Rouet. The CSI3* Ottawa International Horse Show continues Thursday, highlighted by the $35,000 CSI3* Capital Classic, presented by RBC, at 4 p.m. Friday features the $10,000 Under 25 Grand Prix, presented by MarBill Hill Farm, while Saturday brings the highlight event of the week, the $132,000 CSI3* Grand Prix beginning at 2:30 p.m. The show culminates on Sunday with the $15,000 1.40m National Grand Prix. Live coverage of Thursday’s $35,000 CSI3* Capital Classic, presented by RBC, at 4 p.m., and Saturday’s 132,000 CSI3* Grand Prix beginning at 2:30 p.m., is available on Horse Network by clicking here. Admission to the CSI3* Ottawa International Horse Show is free, with donations to Wesley Clover Parks’ retired horse program gratefully accepted. Spectators are encouraged to come out and enjoy all of the family-friendly activities that the Ottawa Equestrian Tournaments have to offer. Visit www.OttawaEquestrianTournaments.com for more information on the CSI3* Ottawa International Horse Shows. Find the latest updates, photos, and information by following Ottawa Equestrian Tournaments on Facebook here.